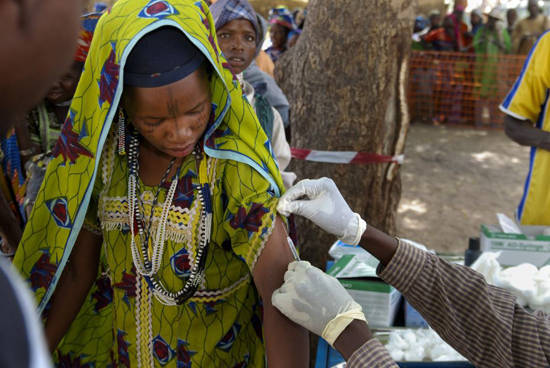 A woman receives a meningitis vaccination by MSF staff in Hayania, in Zinder region. Several countries in West Africa are facing a major meningitis epidemic; hundreds of Doctors Without Borders/Médecins Sans Frontières (MSF) and Ministry of Health teams are mobilized to treat and to vaccinate. In Nigeria, Niger, and Chad, MSF is working with the health authorities to carry out vaccination campaigns for a total target population of around 8 million people. Meningitis epidemics are a well-known scourge in the countries of West Africa, which form part of the “meningitis belt”. But this year, the epidemic has reached a large scope. According to the official national figures, more than 1,600 people infected with the disease have died since the beginning of the year in the two most affected countries, Nigeria and Niger. The epidemic trend is still on the rise in some places. The number of cases is now declining in the areas that were first affected and where vaccination campaigns have been carried out. But new areas are just crossing the epidemic level. In Nigeria, this is the worst meningitis epidemic the country has experienced since 1996. MSF is working in close partnership with the Ministry of Health in nine states. “There are numerous epidemic hotspots all across northern Nigeria,” said Dounia Dekhili one of the MSF emergency coordinators in the field, “the situation evolves rapidly, but the number of deaths remains relatively low.” More than 37,000 cases of meningitis have been recorded by the joint MSF and Ministry of Health teams who are visiting health facilities to review patients and organize drugs supplies when necessary, as well as to collect data. On average, meningitis kills half of infected people if they are not treated, and one out of 10 who are treated. But it appears that during this epidemic, the bacteria are more sensitive to treatment and 97 percent of patients have survived. Niger is relatively less affected but the epidemic is spreading in some southern areas. MSF teams working with the Ministry of Health are treating patients suffering from meningitis and are vaccinating in the Dosso, Maradi, and Zinder regions. A total of 4,591 meningitis cases and 161 deaths have been registered in these areas so far. The vaccine doses must be kept at a certain temperature to retain thier efficacy, so they are kept in coolers with ice packs in the field. “The initial plan was very different than what we’re facing right now,” said Ramón Arrieta, head of the MSF emergency intervention in Dosso region. “The epidemic has spread to other zones so we have had to adapt our activities to the changing situation and vaccinate in new areas.” The resources needed for this campaign are huge. 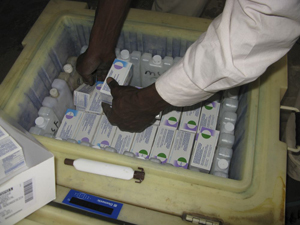 For example, in Zinder region alone, 8,000 ice packs need to be frozen each night to be used by the 65 vaccination teams of five people each. One team can vaccinate up to 1,500 people per day. The target population is two to 30 years old. In total, more than 2.7 million people have already been immunized—1.1 million in Nigeria and 1.6 million in Niger—and additional campaigns for around 5.5 million people are ongoing or planned in Nigeria, Niger, and Chad. Usually, the number of meningitis cases in a given area drop two weeks after the vaccination campaign.